Raqqa, and possibly Damascus, Syria. Muslims generally minted coins in three kinds of metal. The first type is a gold coin called the dinar, the second is a silver coin called the dirham, and the third is a copper coin called the fils (Arabic plural: fulus). Reverse – The following text is written inside a rectangular frame: the titles "al-'Adil” (The Just) and “Nur al-Din” (The Light of Religion). 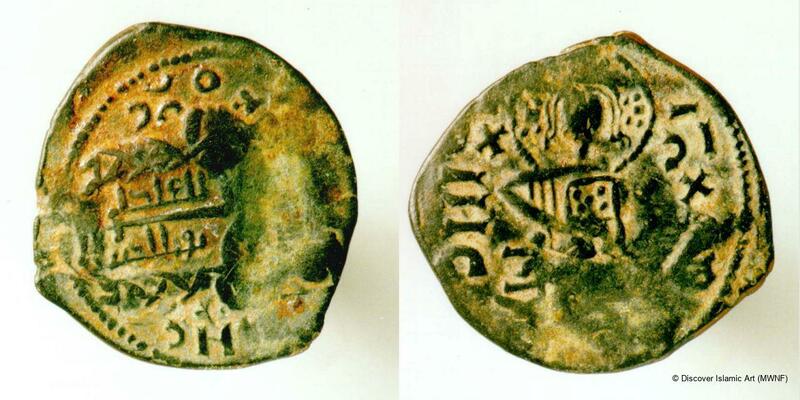 Considering that this type of coin was minted in a manner that resembles Byzantine coins, numismatic experts expect that it was circulated equally in two areas – amongst Muslims and in the Byzantine areas adjoining Muslim territories. 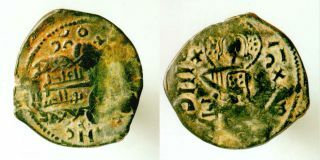 This copper coin, known as a fils, was minted by Nur al-Din Mahmud bin al-Zangi. It shows an intermingling of Arabic and Byzantine features from the Atabeg era. The coin is attributed to the reign of Nur al-Din Mahmud bin al-Zangi (r. 541–69 / 1146–74). This coin is from a collection of copper coins found accidentally by a resident of Raqqa. It was turned over to the Directorate of Antiquities in 1955. The coin was found in the city of Raqqa and is part of a collection of copper coins weighing 50 kg. The place of mint is not recorded on the coin but it is known that Nur al-Din minted copper fils in Damascus. Delpont, E. (ed), L'Orient de Saladin: l'art des Ayyoubides, Paris, 2001, p.34. Sayles, W., and Spengler, W., Turkoman Figural Bronze Coins and their Iconography, Vol. II, Wisconsin, 1996, p.57.